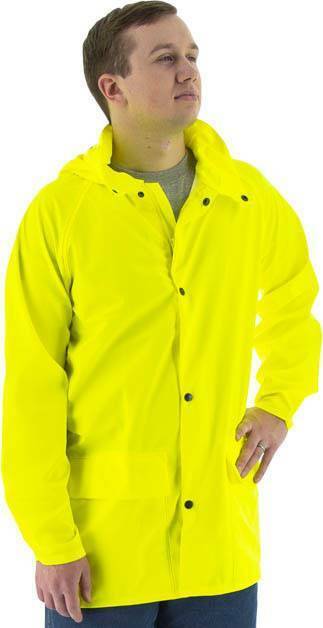 Majestic Hooded Rain Jacket is made from stretchable lightweight Flexothane and is designed with a wide array of features. Comes with matching Flexothane pants. Jacket equipped with a hood, elasticized raglan sleeves, two patch pockets, concealed zipper, metal snaps, and underarm ventilation for comfort. Matching pants equipped with elastic waist, no fly, and feature adjustment snaps at the ankle. Stretchable, lightweight Flexothane that can be worn and folded daily without losing its shape. Colors: Forest Green and Yellow.